Using different climate models, predictions have been made for the future development of the climate. The consensus is that the temperature on earth will rise and with it the sea level. When the air warms up, so will the oceans and seas. When water warms up, it expands. This effect accounts for a large part of the sea level rise. Another part is caused by the melting of land based ice caps like on Greenland; this increases the amount of ocean water. Furthermore rainfall patterns are likely to change as warm air can hold more water and therefore more potential rain. The next diagram shows the IPCC expectations on temperature changes between the end of the last century and the end of this century. 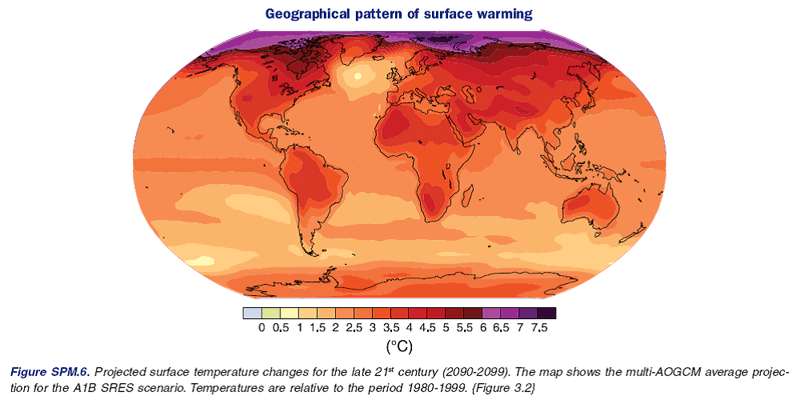 Geographical pattern of surface warming. report, summary for policy makers. The tricky question is whether these changes can be attributed to human activities. The IPCC states that “most of the observed increase in global average temperatures since the mid-20th century is very likely due to the observed increase in anthropogenic GHG concentrations.” Anthropogenic means caused by human activity and GHG concentration refers to concentration of green house gases. So the IPCC concludes that a large part of the increase in global temperature is very likely due to human activities. The effect of green house gases on climate is slow. Stabilising the amount of green house gases in the atmosphere today does not mean that global warming will stop today. Stabilising means that the speed of climate change can be decreased; this is important to be able to adjust to it.